The red-eyed crocodile skink (Tribolonotus gracilis) is a unique skink found in New Guinea. Skinks belong to the family Scincidae, a uniquely adaptive group of lizards distributed nearly worldwide. The name of these lizards derives from their armor-like pointed dorsal scales that resemble those of a crocodile. The skink’s eye is striking surrounded by orange scales that make it appear much larger than it actually is, a trait that occurs in both males and females. Juveniles have similar body appearance to adults but have noticeably different head coloration and patterning that changes as they mature. 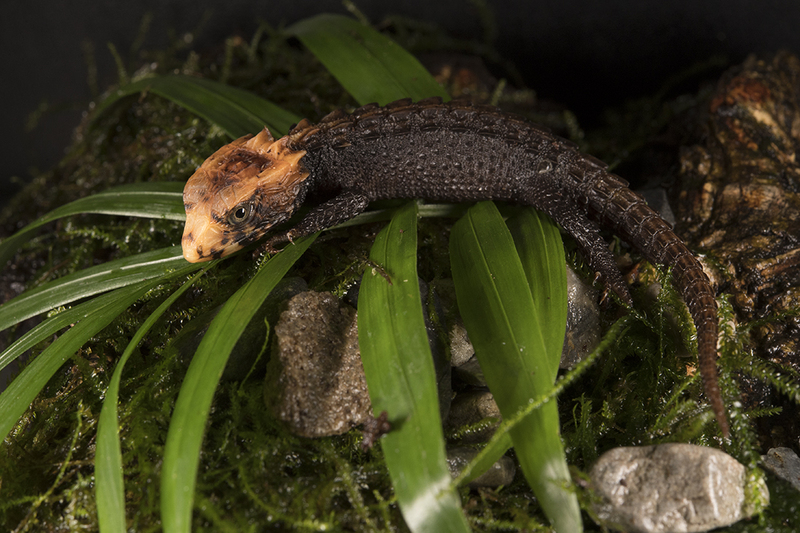 A hatchling red-eyed crocodile skink (above) weighs only a few grams and is a couple inches long. A full-grown adult grows to lengths of eight to 10 inches. Mature crocodile skinks are sexually dimorphic. Males are typically larger and have a stockier build than females and have large pores on the palmar surfaces of the hind feet, a trait absent in females. Another indicator of gender is that males have a few enlarged, orange-tinted scales located at the umbilical scar on their belly. 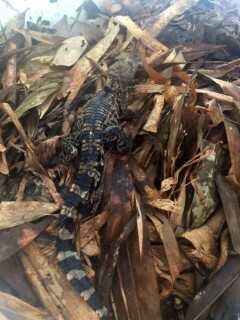 The female red-eyed crocodile skink is only able to lay one egg at a time. She does possess two ovaries, but only one is functional. 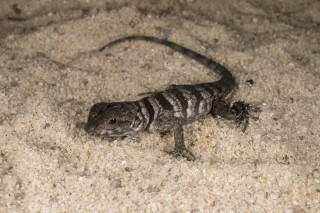 Specialized maternal care makes the red-eyed crocodile skink female unique among crocodile skinks – she will defend her egg by covering it with her formidable body then bite, and vocalize with chirping noises. Crocodile skinks are one of the few lizard species to vocalize when in distress. From the day of hatching, they are able to produce an audible squeaking noise thought to deter predators. Red-eyed crocodile skinks are crepuscular. They are mostly active at dawn and dusk, which makes for an opportune time to hunt for small insects and other invertebrates. 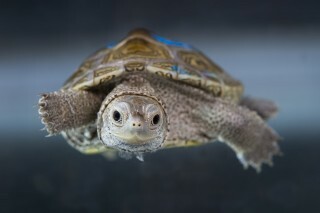 They spend most of their time on the damp and humid tropical forest floor finding shelter under rotting logs and rocks. Amazingly, these reptiles have adapted to the encroachment of humans in their ecosystem and make homes in the coconut plantations that have developed throughout their habitat.